And they won all five games, too. The next highest 5 game total this year is 48, by the Rangers. If anyone knows the all-time record, let me know. The 1950 Red Sox scored 82 runs in a five game stretch (17-12-4-20-29). How did the 4 get in there? Konerko leads MLB in AVG with .399. He also leads the AL in OBP with .476 and is 2nd to Hamilton (.753) in SLG with .681. Konerko leads Hamilton in OPS+ 211-204. Konerko's best year ever in OPS+ was 160 in 2010 and the next highest was 142 ion 2011. So this year is a big jump up for him. "Basic Ball is a three-for-one deal. Fans who enjoy the three American Sports - football, baseball and basketball - will love Basic Ball. Pete Palmer, inventor of the on-base percentage stat and winner of the 2010 Ralph Hay Award from the Professional Football Research Association, has combined with Dave Heeren, creator of the TENDEX formula for basketball to give the reader the most effective statistical methods for rating players and teams in these three sports. They introduce new theories and formulas to analyze the players at the basic level. Each sport is covered in a full section and more than a hundred pages of databases that give statistical ratings for baseball's greatest hitters and pitchers; the best NFL players of All-time; and every active and retired NBA and ABA basketball player." Palmer was doing some pretty advanced linear weights analysis back in the 60s. See Pete Palmer’s All-Time All-Star Team, 1969. This year he has done well with no runners on but in other cases not so well. He has no problem like this over his career and so I think his ERA+ should rise over the season. Pujols has a career OPS+ of 168 and last year it was 148. So the 68 so far in 2012 is pretty shocking with more than 25% of the games played. He only has a .224 BABIP while his overall AVG is .213. For his career, those numbers are .309 and .325. So it does not look like any bad luck on balls in play. His line drive % is 20% while for his career it is 21%. So nothing major there. But hit HR/FB rate is 5.3% while it is 15.3% for his career. This year 18% of his flyballs have been in the infield while his career rate is 11%. Maybe he is popping up alot. His GB/FB rate is .70, same as it is for his whole career. If his HR% this year was the same as it was last year (6.4%), he would have 11 HRs and his AVG would be .253 (assuming it was 7 FB outs turned into HRs). So maybe he is not hitting the ball far enough. If he wants to bat .299 this year (as he did in 2011), he needs to bat .337 the rest of the way (assuming he gets 579 ABs). Last year his April & May OPS+'s were 112 & 113. This year they have been 61 & 70. To reach an OPS+ of 148 this year (what he had in 2011), he needs an OPS+ of 181 the rest of the way. Last year, his post May OPS+ was 172. This year his SO/AB rate is .129, just a little higher than his career rate of .112. But his BB/AB rate is only .045 while it is .113 for his careeer (in both cases, intentional walks were taken out). So he is not walking alot and maybe he is swinging at too many pitches. In his last 9 games or 36 ABs, he has 10 hits, good for a .278 AVG. But if he does that the rest of the way, he ends up hitting just .258. He does have 1 2B and 3 HRs in the last 9 games. So his SLG over this stretch is .556. If he did that the rest of the way he still finishes with just a .487 for all of 2012. How Is That 23 Year Old Phenom Pitcher Doing? You Know, The One Whose Last Name Starts With S? Oh, you mean Chris Sale of the White Sox. Pretty well. His career stats are in the table below. 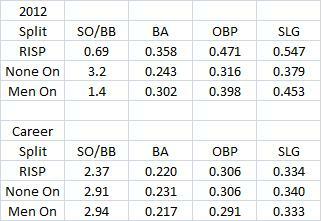 Now his being a reliever in 2010-11 helps, since relievers usually have better stats than starters. From 2007-11, relievers had, on average, an ERA that was .037 lower than starters. Sale, a lefty, also has faced left handed batters about 40% of the time. So that helps him. But he is certainly doing well this year as a starter. In 32 IP, he has an ERA of 2.81, with 24 hits allowed and 8 walks, 29 strikeouts and just 2 HRs allowed. 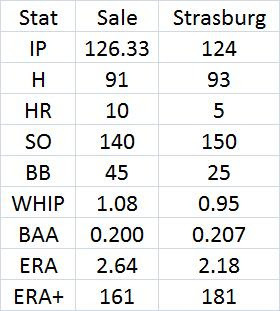 If Strasburg had Sale's career stats or stats this year, I doubt anyone would think he was not living up to his potential. 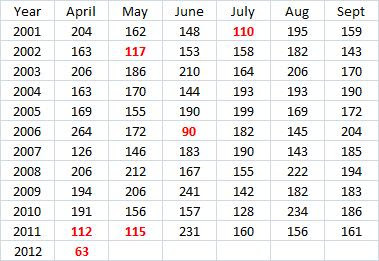 The table below shows his OPS+ for every month of his career. 100 is average and it adjusts for the league average in each month and park effects. Now this April was his worst calender month. It is possible that he had a worse 23 game stretch sometime in his career (he played 23 games in April). But when you look at each individual month, it is hard to see when that would have happened because he would have had to offset an OPS+ of 63 with an extremely high one in the other games. He could have had an OPS+ of 63 over 23 games in June 2006 and then 177 over the other 7 (no problem for Pujols). That would get us 90. So for Pujols to have had an OPS+ of 63 over some other 23 game stretch is possible. But it seems unlikely if you look at his next worst month, the 110 in July 2001. If he had an OPS+ of 61 in 23 games that month the other 7 would need to be 263. And I know, I recenlty posted Should The Angels Be Worried About Pujols? (and I basically said no). But his OPS was .668 then (4-18). Now it is .570. His AVG-OBP-SLG are .217-.265-.304. The league averages are .252-.318-.408. He did recover after a slow start last year in the first two months. But at least those were above average. The table shows all months with OPS+ < 120 in red. He has struck out once every 6.57 ABs this year. Last year it was 9.98 and for his career it is 8.91.